Sometimes dictionary-makers change their minds about the origin of a word, given access to evidence that is new, or newly available. This happened to us recently at the Australian National Dictionary Centre, when a journalist contacted us to ask about the origin and meaning of the Australian phrase to have the wood on. To have the wood on (also to get the wood on) means ‘to have an advantage over (someone)’, and it is used in both Australia and New Zealand. Noosa gets the wood on Caloundra. When the term was included as an entry in the Australian National Dictionary (1988), the editors thought it was likely to be derived from two related Australian words, the verb to wooden and the noun woodener. 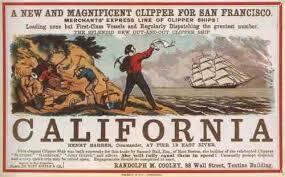 These words predate our phrase by some twenty years, and were therefore in the right time frame to provide an origin. A woodener, 'a knockout blow'. To wooden means ‘to stun; to make a corpse of (someone)’. It is formed after the British English verb to stiffen, in the sense of ‘to make stiff, as in rigor mortis’, and Australians might recognise it in the exclamation stiffen the crows! A woodener is ‘a knockout blow’. 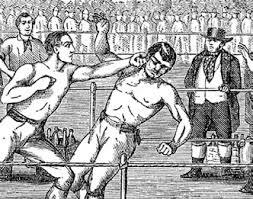 It seemed likely that ‘the wood’ in the phrase to have the wood on was a figurative allusion to these earlier Australian terms; to have an advantage over someone is, figuratively, to be able to deliver them a knockout blow, or to stun them. So much for the local theory. Given that the Australian idiom to have the wood on has the same meaning, the similarity of the two terms is very persuasive. As well, the dating of the first American evidence in the 1850s suggests a way in which to get the deadwood on may have become known in Australia. 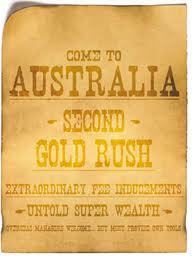 The decade of the 1850s coincides with the heady days of the goldrushes, which saw Australia’s population swell with migration from all parts of the globe, and which included the movement of goldminers between the Californian and Australian goldfields. As a result there is a significant overlap in goldfields terminology used by miners in both countries, and colloquial expressions unrelated to the business of mining will also have been traded in the melting pot of the goldfields. To get the deadwood on was probably one of them, evolving in Australia into the variant forms to get the wood on and to have the wood on. On balance it is much more likely that these Australian expressions have their origin in American slang, not Australian, and this change in origin will be reflected in the forthcoming second edition of the Australian National Dictionary. This entry was posted in Australian National Dictionary, colonial history, etymology, gold rush, slang and tagged get the wood on, have the wood on, Jonathon Green, to wooden, woodener by Julia Robinson. Bookmark the permalink.